I highly recommend this book for all authors. It’s a great resource! My full review is below. 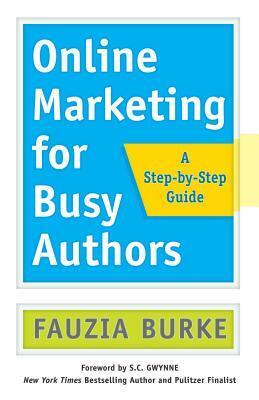 This is a terrific book for authors interested in utilizing online resources for promoting their writings. While the content tends to be aimed at an Internet novice, more experienced authors can use the tools offered by Burke to reevaluate their current online marketing efforts. Burke asks, “How do you prevent your brand from getting lost in all the social media noise? The answer: Be uniquely you. Aim for authenticity” (page 9). Sounds simple. Right? But how exactly do you accomplish that? Burke offers step-by-step guidance, including coming up with your own “brand statement” that will help you devise content to share on social media. “To become a well-known and well-established professional author you have to be ready for the long haul, so adjust your expectations and remember that building an effective brand is a marathon, not a sprint” (page 15). To maximize the benefit of social media, “You need to know where your readers spend their time and what social media sites they visit” (page 19). Burke provides information to help evaluate your audience and learn which platforms they most likely use. There’s also an extensive exercise for setting realistic goals and priorities for the marketing of your book. Burke offers detailed advice on how to maximize your usage of various outlets. For example, regarding using a Facebook author page to advertise an upcoming event, “you can target people who live five to twenty miles from the event location. We have used this type of advertising for many of our clients, and every time we have seen bigger turnouts than expected” (page 45). This book isn’t only about utilizing social media, it’s also about other necessary online marketing essentials, such as managing your website and your mailing list. Burke includes terrific advice, checklists, and exercises to make sure these tools are helping you achieve your goals. “Your most important marketing task is to keep your Super Fans happy and engaged” (page 74). I know personally, I don’t send out a regular email to my readers, because I don’t want them to think I’m “spamming” them. However, Burke gives great advice, which I want to immediately put into practice. She says, “don’t do it only to promote a new book. You should communicate with your fans even when you have nothing to promote” (page 75). This makes sense! I suppose if you only email fans when there’s something to promote, that will feel more like spamming than emailing regularly will. Plus, Burke offers valuable advice regarding content to include in your email newsletters. I’ve marked up ONLINE MARKETING FOR BUSY AUTHORS with post-its, highlights, and notes, and I’m ready to put what I’ve learned from it into action. My favorite line from the book: “No amount of social media is going to help you sell a book that is not well written” (page 92). Great informative article. It's really effective that to maximize the benefit of social media, you need to know where your readers spend their time and what social media sites they visit. Thanks for this great insightful post.